People have been theorizing about the significance of Jack’s “five” tattoo for some time now on the television program “Lost” – some consider it central to the plot, and others think it is simply Matthew Fox’s personal tattoo, perhaps a reference to his time on the other program “Party Of Five”? But, as a Discordian I am likely to more focus on the number five than I would on -say- six. Although, I’m sure I would have fun with that one too, I just might not be writing about it here. 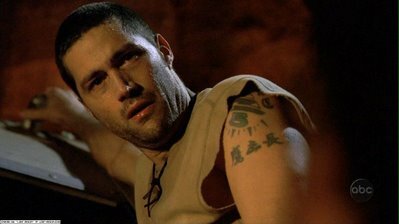 I’ve read that Matthew Fox has several tattoos, but that he is made to cover up some of them, but not others – which would lend credit to the theory that the tattoo in question has some sort of significance inside the show. In the first episode of Lost Jack told Kate to ‘count to five’ when she is frightened, a scene which was referenced in last night’s episode of Lost as well – it being the code that Kate will use to let Jack know that she is safely away from the Others with Sawyer. This would almost suggest that there is some connection between Jack and Kate – Jack, a man who betrayed his father, and Kate, a woman who killed her father. So, I ask: Is it ‘mere’ coincidence, or synchronicity, that the Fifth Commandment is “Honour Thy Father And Mother”? You are currently browsing the archives for the Matthew Fox category.